Foreign produce. 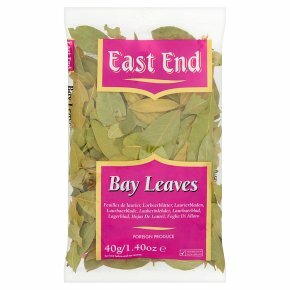 Suitable for vegetarians.Bay leaves have a strong, spicy flavour and a striking aroma which becomes even more apparent when the leaves are shredded or crushed. They are dried in the dark and retain their natural colour. They are used as a spicing agent and should be used sparsely. Bay leaves may be added to the stock for boiled fish and in soups. It can be used for flavouring curries, preserving and marinating. Bay leaves are a must in herbs marinades for fish, meat & poultry. It is recommended that half or whole leaf is added to game, liver casseroles, multon hot pot, goulash.However, the bay leaves should be removed from the dish before serving. They stimulate the appetite and are recommended as a pain reliever and remedy for skin and ear troubles. Bay leaves are widely used in Indian cooking, particularly in rice & curry dishes. The bay leaves provides a distinctive flavour to various foods items.